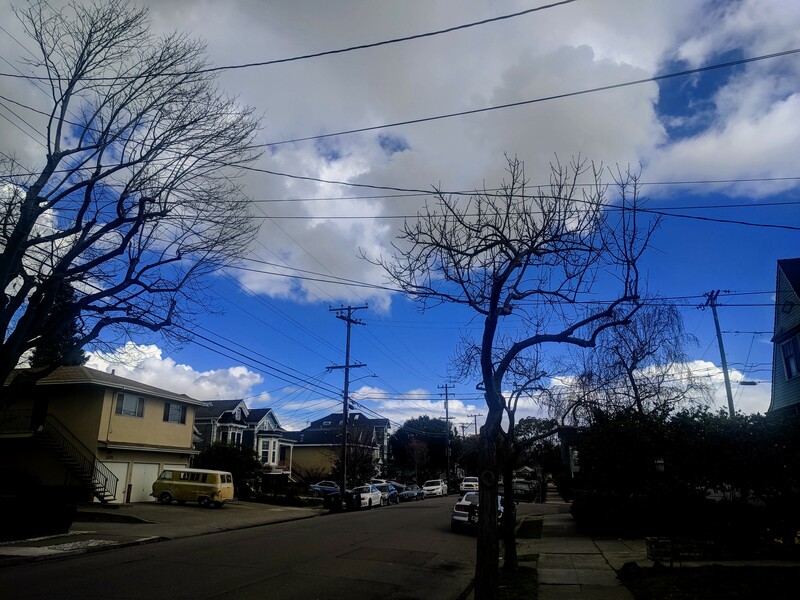 Not that hail is ever expected, or at least not very much expected, but in the springtime month of March it’s very unexpected in Alameda, California. Nonetheless, I left for a walk with blue skies, and a short while later noticed a darkening front blowing in. A few minutes later the skies opened up and a torrent of rain slammed into the pavement (and me, but I was preventatively wrapped in Gore-Tex). The temperature, which had been springtime shorts-and-tee-shirt warm, got quickly cold. And I noticed the driving rain knocking white muck around. Well, of course not. The ground had been clean and tidy. It was hail! Lots and lots of hail! Waves after waves of hail whipping down through the palm trees all around me. Not only wasn’t the rain letting up, it was overwhelming the drainage paths, including some funny pedestrian-unfriendly results. I spent the next quarter-hour watching those around me, unprepared for the weather, getting soaked and running under overhangs or into businesses to escape the water both falling from the sky and quickly becoming untraversable pools in the road and along the sidewalks. Then, just as quickly as the deluge had arrived, it disappeared, leaving behind fluffy white clouds and a deep blue sky.